Yeah, if I were you, I'd probably stay in the RZ. Especially w/no "heart", staying super-close to the main stage in GA is a demanding experience. And also, yes, you don't have to wait in line nearly as long for a good spot in the RZ, and it's way less crowded, for sure. I'd suggest, however, being there when the RZ opens (probably c. 5-5:30), because in the past, some RZ spots have been significantly better than others. The only downside is, if the main stage really is on the other end from the RZ, then most of the time you won't be particularly close to the band. On the other hand, arenas are much smaller than stadiums, so you still wouldn't be super-far away. As far as when we'll finally know for sure about the stage, beats me. Certainly the info released so far is confusing, at least unless one does a lot of sleuthing. I'd love to know before the last general onsale on Monday, but I doubt we will. By the way, which show are you going to? I´m going to Chicago 3 (Red Zone). But I´ll also try to get tickets for Chicago 4 on monday (general sales). A 200 level (center of arena) is good choise? Introduce a B-Stage into that area with a band like U2 who can make an arena feel like Irving Plaza, raise the ticket price, put in a few amenities like booze and t-shirts, and put the infrastructure in place to allow ease of access for those folks who can't/won't/shouldn't queue all day, along with a feel-good contribution to Africa and the potential promise of a quickie backstage walkabout, and you've just increased your yield from that previously dead real estate. Are the RZ seats the absolute best seats in the house for the whole show? No. For a few songs? Yes. Will it be a great experience when it's all added up? More than likely. Based on the original layout I saw of the stage, I snapped up the Red Zone on the presale today thinkin it was beside the main stage. However the more I look at it and ponder, I know that's not the case. However, my wife is 5ft tall and I'm 5'7". Regular GA is useless to us. We're too short. She wanted a fun floor experience for a U2 arena show, so RZ is the only option for us. i dont really care anout the frills, i care about the show. We're doing 2 nights in the lower bowl at MSG so we'll get another perspective from there as well. Now, reading your post, I am not sure if I chose the best option (Red Zone), lol! Maybe the best seats should be lower level seats in the middle of arena. As I said before I just want to stay close of the band (don´t need to be in the first row, just close) and stay confortable. In Pop Tour and Vertigo I stayed at GA, but far from the stage, didn´t like the experience. A lot of sensible comments. And if there really is a main stage on one end and b-stage/RZ on the other, U2 will certainly be spending more time at the b-stage than they have before--probably like they did w/Zoo-TV in stadiums, etc., and like other groups increasingly do (e.g., 3-4 songs, something like that). In lieu of a b-stage on the last few tours, they came out to the apex of the "heart" (which doesn't seem to exist this tour) for c. 2 songs (plus occasionally wandering around on the heart catwalk). So the RZ will have a fantastic view of some part of the show. And especially without a heart, getting/staying close to the main stage is a major ordeal, which makes the RZs more appealing than if there were a heart. Plus, if you're not reasonably tall, all the more reason to go for the RZ, I agree. My wife and I are going to Chicago 1 (lower bowl) and 2 (GA), and a Chicago buddy & I have GA for Chicago 4. On Monday I'll get a single ticket for myself for Chicago 3--not sure what kind yet (if I have a choice!). Either GA, good lower bowl, or RZ (if I can get it). If I do get RZ for Chicago 3, see you there! (unless we're on different sides, of course). Regarding your Chicago 4 ticket choice, sure, a 200 level/center arena would be fine. But, even better (and same price!) to get similar lower bowl tix. And best of all (if I'm right about where the main stage is), would be lower bowl 113 (and within this section, closer to 112 than 114) or 121 (closer to 122 than 120). Next best, 112 or 122. Also, are you getting 1 or 2 tix for Chicago 4? It's always easier to get a good single--but of course, you (and most, including me most of the time) will be going for pairs. Finally, I might try for MSG 5 & 6 tix, but I only have so much cash! Well, given everything we've been saying about GA, being close there is tough unless you're really willing to wait all day, endure very crowded conditions, etc. So, for sure, the best close/comfortable combination would be lower bowl seats (IMHO, and if the main stage is really across from the RZ, closer to the main stage--see previous post). But don't worry--I bet you'll really enjoy your RZ experience (also given the above). Folks - Just a hunch, but to my experienced U2 concert going eye ('83 till now), the stage will be configured with an "Ie" (innocence and experience) taking up most of the floor and a catwalk connecting them. The two sides (top/bottom) of the "e" will be where the red zones are with the "I" being the other stage. As has been stated in earlier posts, these will be really good and really convenient. No Stress, just awesome. U2 may be in show business, but always put value out there for cost of the ticket, steep as it may be in this case. So don't stress. Enjoy! It will be my first time there. I'll get two tickets for Chicago 4 - if I can because general sale is very hard! Is it possible to choose the block/seats? I just see the option "best available". Do you really think the shows will be different as U2 said last week? Or just 3 or 4 songs? My side on RZ for Chicago 3 is 1. Just the facts RZ no wait in queues, the space is not so crowded, and it is also close to stage, I'm happy! I'm from Ann Arbor, MI (c. 4 hours from Chicago); my buddy (re Chicago 4) lives there. Regarding getting your Chicago 4 reserved seats, if you're getting top price (c. 300), that likely won't be too hard, as demand will be a bit lower than for the 1st two shows. Regarding choosing them, when they go onsale, directly choosing them won't be possible (other than the price) for a while (until buying slows down considerably). So, you may want to go for the 1st 2 seats you get from "best available" that you like. From my experience, this whole process is pretty nerve-wracking. Why? Because TM will NOT automatically actually offer you the best of what they've got left (this helps them sell some of the less desirable seats). So, ideally, be prepared to reject seats they offer (e.g., if the 1st two are 200-level, etc.). Good 200-level seats will be available for hours, most likely. Or, say they offer something from the lower bowl, but more toward the RZ. Maybe reject those too and try again. But again, this is a stressful process, because of course one worries that rejecting so-so seats may leave you ultimately getting worse seats. But again, TM will frequently offer worse seats than they actually have for the above reasons. Often I end up getting the 3rd or 4th pair offerred, something like that. But there is some risk in this. On the other hand, you'll definitely have time to try this for a while before the selections are truly generally worse. Whole thing makes me nervous just thinking about it! And yes, I'd suspect the shows will be substantially different. Typically, especially w/arena tours, they'd vary 3-4 songs a night in general--so I think we'll see substantially more variation here--perhaps more like 8 songs being changed. If they were only going to change 3-4 per night, I doubt they'd make such a big deal about the whole paired show thing. Of course, lots of people will only see one show, so they probably won't go totally nuts with changing the setlist. And yeah, I bet you'll like the RZ for Chicago 3. I hope to snag one of those myself! That map of San Jose/CA is from a reliable source? If yes no more doubts how will be the stage, right? 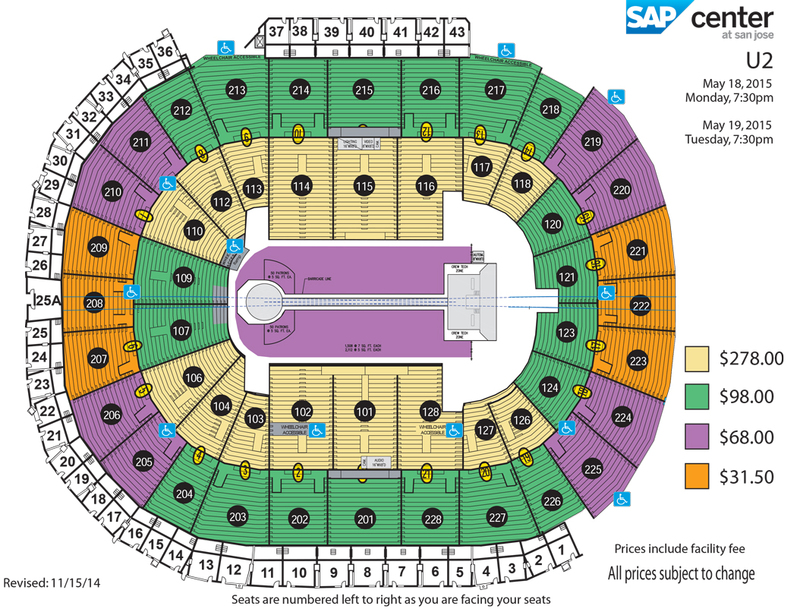 In another thread, I posted that I actually called the San Jose SAP arena, and was told by a very helpful person that yes, the main stage is on the right (on the venue map, which is reversed from the TM map--see below), and the b-stage on the left--just what it looks like. She further told me that their (venue) map was based directly on what U2 production had sent the venue. Given all this, and the significant detail on the SAP map (and hey, is SAP just going to make all that detail up? very unlikely), yes, I think the whole stage setup/where's the RZs question is resolved (especially when taking into account the European "horseshoe" arena maps which are also consistent w/this--especially Amsterdam). I am going to the show with my wife. My priorities are to be comfortable and close to the band. Don't need to the in the first row, just close to the band. I don't want to stay hours ahead of time in the queue. I guess it is not necessary in RZ, right? Also I guess RZ is much less crowded than GA, right? Reading you post I think it would be a good idea to stay in RZ. Nice to know that I can go to GA and back to RZ how many times I want! In Vertigo tour (stadium) I stayed in GA, very crowed and stayed far from stage. And I stayed for hours in the queue before the show. Will you have to wait Vancouver to know about the stage? Will it not be announced before? In the Vertigo Tour, East Rutherford we went there around 5 pm... and they gave us a number.. there was a GA Fan Club line and the regular GA line. Everyone got a number. So when the gates will open, that was your number IN LINE. We were number 78.. we walked inside, they scanned my tickets and were told we could go INSIDE the CIRCLE!! So we ended up front row! Amazing experience. Maybe this time around since its back in Arenas, it would be the same system?? I got Red Zone tickets for Forum... Hope they are as amazing as the GA experience we had! Looks like there's no "circle" this time at all. Re your RZs, lots of data (which took a lot of digging--see, e.g., San Jose SAP venue U2 map above) suggests that the RZs will be by the b-stage (not the main stage). They should still be pretty great, though. I'm going to try for RZ for Chicago 3 tomorrow. If I can't get tomorrow 101-121-122 or 111-112-113 for Chicago...what would you prefer? 102-103, 109-110 or 218-219, 233-234? It is very likely blocks 114-120 would have limit views, no? Also I am afraid to get 113-121 (closer to 114-120) due the same reason. Lets see if general sale tomorrow will be so crazy as last week. I would like too much to get 2 tickets for Chicago 4. Wow. Excellent questions. By the way, one general thing to know is that the seats in each row are numbered "left to right", AS YOU'RE LOOKING AT THE SECTION FROM THE FLOOR. So, looking at the TM map, sections like 121, 122, etc. have numbers going from left to right (e.g., 1 to 22 or whatever), whereas "mirror" sections (e.g., 112, 113) have numbers that (from the perspective of the TM map) go up from right to left. You might want to look at a "blown-up" version of the current (Chicago 1 & 2) maps and hover your cursor around various seats; you'll see what I mean. Why is this important? Because all positions in a row (within a section) are not created equal--they tell you whether they're in the middle of the section or more toward the sections on either side. Also, in general, lower rows are always better (both closer and improve your viewing angle of the stage). So, for example, a low row/high seat number in 112 could easily be better than a higher row/low seat number in 113. Also, I think the entire 113 or 121 sections are safe--I wouldn't worry about those at all if I were you. I'd even consider 120 (w/higher seat numbers) or 114 (w/lower seat numbers) if the row number was low (below 10, say), although these might be slightly risky. And I'd say 115-119 should be avoided for sure; but that under certain circumstances (just mentioned) 120 or 114 could be good. And finally, your main question: If 101/121/122 or 111/112/113 are not possible, I'd go for 218/219 or 233/234 over 102/103 or 109/110 for sure. In fact, I'd seriously consider those upper level areas over 101 or 111. Again, depends on the rows/seat numbers (e.g., high seat numbers in 101 or lower seat numbers in 111 are pretty close to the next-further sections). And 218/219 or 233/234 with a low row number should be pretty darn good. Keep in mind the 200-level overhangs the 100-level to some degree, so lower rows in 200 level are actually closer than some higher rows in corresponding lower bowl sections (although, of course, this is somewhat offset by 200-level being higher). My crystal ball tells me (famous last words) that demand will be significant, but not as strong as for Chicago 1 & 2, which should help. I predict you'll land some nice seats for Chicago 4. I hope I'm right! I'm also hoping I can get something good for Chicago 3! Oh yeah, one last thing. My sense from past experience is that the stage tends to be a bit farther to the left (e.g., in the Chicago diagram) than the TM maps make it appear. This is part of why I think basically everything in 113 or 121 would be fine. As we can't choose our seats, it will be "best possible", I'll try 4 times these seats. If not succesful, I'll get what TM give me in the 5th time. No other solution, right? You're welcome! Your plan sounds about right--except that if you get offered lousyish stuff on the 5th try, I'd toss 'em and try again. And of course, if you get something pretty good (even if not outstanding) earlier, you may want to pull the trigger then. And as I've said before, decisions about exactly when to pull the trigger can be nerve-wracking. One last thought--you might even want to consider restricting the search to full price 200-level at some point (maybe even from the start). I bet you'd snag some nice, lower-row 200 level seats. And finally, all my advice is just based on my experience and strategizing given a bunch of factors (I also happen to be a professional researcher, which helps), and comes w/no guarantees! Good luck; wish me the same. Maybe my first try I'll choose 200-level, if comes a good block and low row, deal! If not, "best available". Just got 2 tickets for Chicago 4. I was searching for 100-level, just finding 121 (closer 120), 113 (closer 114) and 110. Then I found 218 Row 4 and bought it! I dont know if it was a good deal. I hope you were luck! Congrats on the good tix. Personally, as you know, I would've preferred the 121 or 133 tix instead (unless the ticket rows were quite high), but 218 Row 4 is really, really, nice, no question! And...wait for it...I DID manage, to my amazement, to score an RZ1 ticket for Chicago 3. So, small world, eh? I'll be seeing you in the RZ! We're even on the same side. Great news, you also got RZ1 for Chicago 3! Lets drink a beer there! Wow, is it allowed beer there? It was hard to get RZ today? The row in 121 and 113 blocks that I found was 14. I guess the last is 18, right? I dont know if I did a good deal, but no problem, lets go! Now my goal is save a lot of money to pay the tickets! Ah, row 14 in 121 or 113, eh? Well, it could maybe go either way, but given your great row for 218, I'd say that those are basically at least as good as the 121/113 tix you were offered. So congratulations! I'm virtually certain you'll be very pleased. You definitely got an excellent deal! And yes, it was hard to get RZ. I actually tried a trick that somebody else mentioned--I just requested 1 ticket (which is fine, because I'm by myself for Chicago 3). Jumped on the onsale right on time, and lo and behold, it came up. Very happy camper. I'd even (in another browser) requested another single RZ ticket (in case my first try didn't work), and that came up too! After some thought, though, I let it go. And absolutely, let's have a beer (or two) in the RZ! One of the RZ perks is we have our very own (cash) bar, believe it or not. Alcohol is available throughout the arena, but it's very convenient to have our own bar (not to mention some kind of special access to bathrooms). For you Red Zone folks, congrats, take lots of photos and post up on the forums if that is even possible. i do have 1 spare in red zone on the 29th October in london face value if anyone is interested. The misses has pulled out but im still going.